Seymour Papert wrote a book called Mindstorms: Children, Computers, And Powerful Ideas. Bret Victor says in Learnable Programming that Mindstorms is “perhaps the greatest book ever written on learning in general”. Nestled in Mindstorms is juggling lesson which, it is claimed, reduces the time required to learn to juggle three balls continuously “often to as little as twenty or thirty minutes.” It took me about 40 minutes, but I was using ping pong balls, which are too light, small, and bouncy to be ideal. I have no other excuses. The next section is how to juggle, from Mindstorms. Start with balls 1 and 2 in the left hand and ball 3 in the right. Throw ball 1 in a high parabola to the right hand. 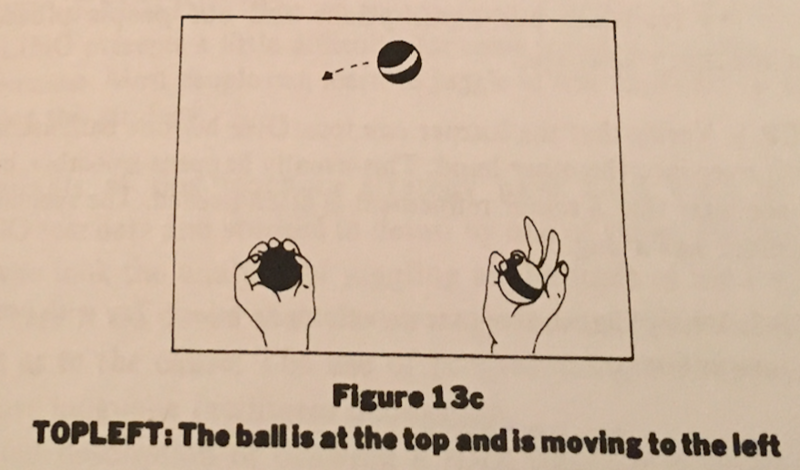 When ball 1 is at the vertex throw ball 3 over to the left hand in a similar high parabola, but take care to toss ball 3 under the trajectory of ball 1. 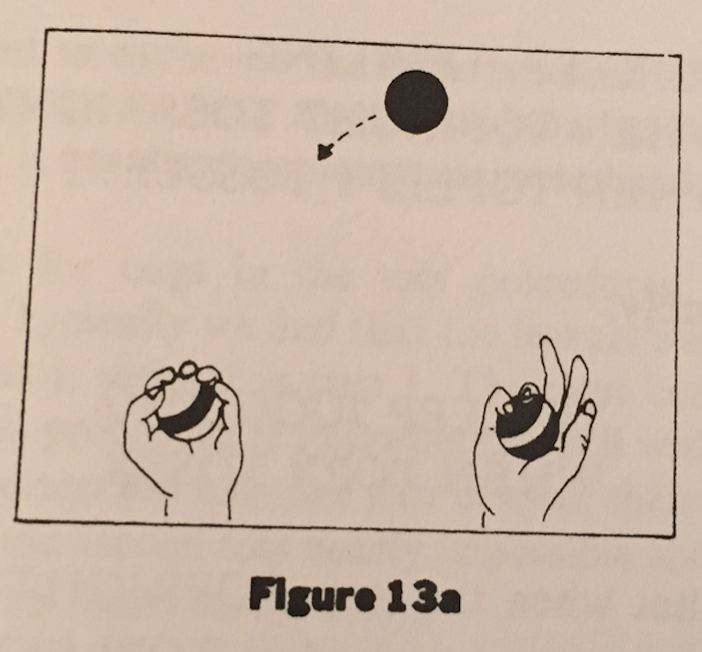 When ball 1 arrives at the right hand and ball 3 is at the vertex, catch ball 1 and throw ball 2 in a trajectory under that of ball 3, and so on. This description is basically a brute-force straight-line program. It is not a useful description for the purpose of learning. People outside the computer culture might say it is too much like a computer program, “just one instruction after another.” It is like certain programs, for example Keith's first MAN program. But we have seen that stringing instructions together without good internal structure is not a good model for computer programming either, and we shall see that the techniques of structured programming that are good for writing programs are also good as mathetic descriptions of juggling. Our goal is to create a people procedure: TO JUGGLE. As a first step toward defining this procedure we identify and name subprocedures analogous to their role to the subprocedures Keith used in drawing his stick figure (TO VEE, TO HEAD, TO LINE). In the case of juggling, a natural pair of subprocedures is what we call TOSSRIGHT and TOSSLEFT. Just as the command VEE was defined functionally by the fact that it causes the computer to place a certain V-shaped figure on the screen, the command TOSSLEFT given to our apprentice juggler should “cause” him to throw a ball, which we assume he is holding in his left hand, over to the right hand. But there is an important difference between programming TO MAN and programming TO JUGGLE. The programmer of TO MAN need not worry about timing, but in setting up the procedure for juggling we must worry about it. The juggler must perform the actions TOSSRIGHT and TOSSLEFT at appropriate moments in a cycle, and the two actions will have to overlap in time. Since we have chosen to include the catching phase in the same subprocedure as the throwing phase, the procedure TOSSRIGHT is meant to include catching the ball when it comes over to the left hand. 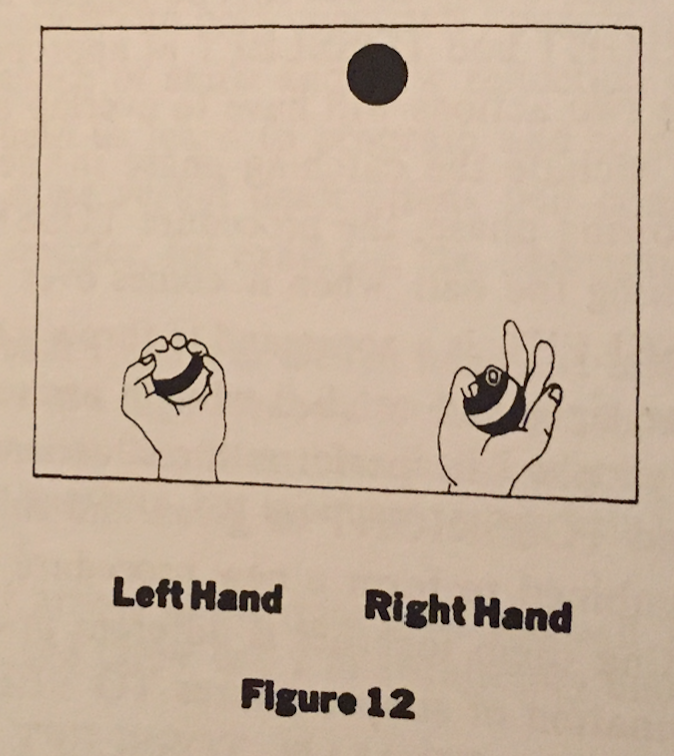 Similarly, TOSSLEFT is a command to throw a ball from the left hand over to the right and catch it when it arrives. Since most people can perform these actions, we shall take TOSSLEFT and TOSSRIGHT as given and concentrate on how they can be combined to form a new procedure we shall call TO JUGGLE. Putting them together is different in one essential way from the combination of subprocedures TO VEE and TO HEAD to make the procedure TO MAN. TOSSLEFT might have to be initiated before the action initiated by the previous TOSSRIGHT is completed. In the language of computer science, this is expressed by saying that we are dealing with parallel processes as opposed to the strictly serial processes used in drawing the stick figure. To describe the combination of the subprocedures we introduce a new element of programming: The concept of a “WHEN DEMON.” This is illustrated by the instruction: WHEN HUNGRY EAT. In one version of LOGO this would mean: Whenever the condition called HUNGRY happens, carry out the action called EAT. The metaphor of a “demon” expresses the idea that the command creates an autonomous entity within the computer system, one that remains dormant until a certain kind of event happens, and then, like a demon, it pounces out to perform its action. The juggling act will use two such WHEN DEMONS. To fill the blanks, the “somethings,” we describe two conditions, or recognizable states of the system, that will trigger the tossing action. But this diagram of the state of the system is incomplete since it fails to show in which direction the top ball is flying. To complete it we add arrows to indicate a direction (Figure 13a) and obtain two state descriptions (Figures 13b and 13c). which declares that when the state TOPRIGHT occurs, the right hand should initiate a toss and when TOPLEFT occurs, the left hand should initiate a toss. A little thought will show that this is a complete description: The juggling process will continue in a self-perpetuating way since each toss creates a state of the system that triggers the next toss. Now, we translate our assumptions and our people procedures into a teaching strategy. STEP 1: Verify that the learner can toss. Give her one ball, ask her to toss it over into the other hand. This usually happens smoothly, but we will see later that a minor refinement is often needed. The spontaneous procedure has a bug. This is intended to exchange the balls between left and right hands. Although it appears to be a simple combination of TOSSLEFT and TOSSRIGHT, it usually does not work immediately. STEP 3: Look for bugs in the toss procedures. Why doesn't TO CROSS work? Typically we find that the learner's ability to toss is not really as good as it seemed in step 1. The most common deviation or “bug” in the toss procedure is following the ball with the eyes in doing a toss. 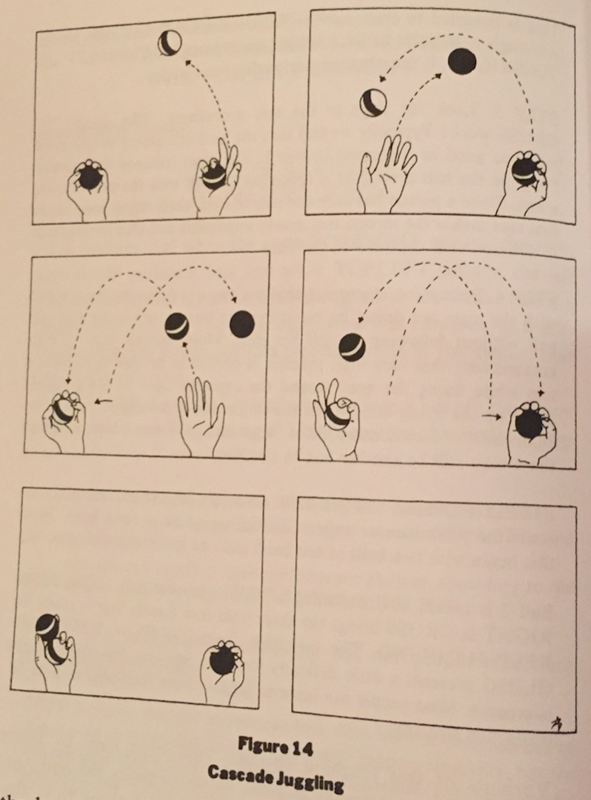 Since a person has only one pair of eyes, their engagement in the first toss makes the second toss nearly impossible and thus usually ends in disaster with the balls on the floor. STEP 4: Debugging. Assuming that the bug was following the first ball with the eyes, we debug by returning our learner to tossing with one ball without following it with her eyes. Most learners find (to their amazement) that very little practice is needed to be able to perform a toss while fixing the eyes around the expected apex of the parabola made by the flying ball. When the single toss is debugged, the learner again tries to combine two tosses. Most often this now works, although there may still be another bug to eliminate. STEP 5: Extension to three balls. Once the learner can smoothly execute the procedure we called CROSS, we go on to three balls. 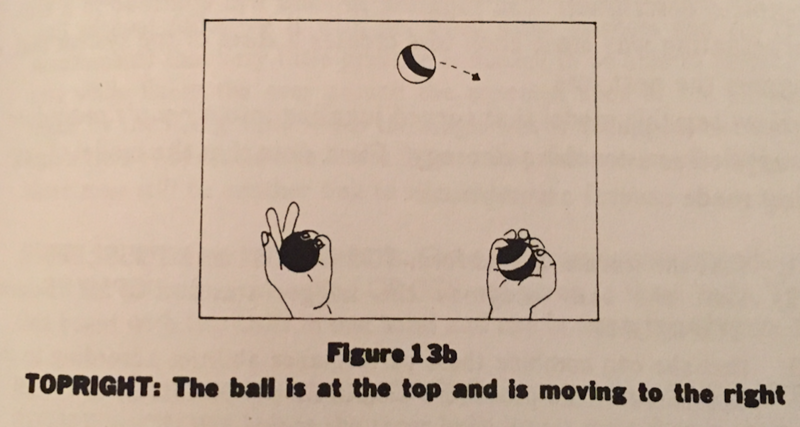 To do this beings with two balls in one hand and one in the other (Figure 14). Ball 2 is tossed as if executing CROSS, ignoring ball 1. The TOSSRIGHT in CROSS brings the three balls into a state that is ready for KEEP JUGGLING. The transition from CROSS to KEEP JUGGLING presents a little difficulty for some learners, but this is easily overcome. Most people can learn to juggle in less than half an hour by using this strategy. Variants of this teaching strategy have been used by many LOGO teachers and studied in detail by one of them, Howard Austin, who took the analysis of juggling as the topic of his Ph.D. thesis. There is no doubt that the strategy is very effective and little doubt as to the cause: The use of programming concepts as a descriptive language facilitates debugging. I think this, and all of Mindstorms, is pretty cool. If nothing else, there is no longer any reason for anyone not to learn to juggle!